Spanish t-shirts There are 30 products. Unisex cotton t-shirts for adults and children. Fun and entertaining t-shirts make great gifts or items to wear this summer. They are souvenirs from Madrid and Spain. They are ideal for wearing on your vacation and take up little space in your suitcase as well as weighing very little. Lots of messages colors and designs!! 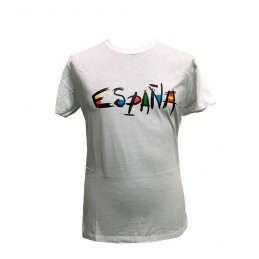 Unisex T-shirts, 100 % cotton, adult, "España" available in various adult sizes. It is a perfect souvenir of your visit to Spain. Made in Spain. Unisex T-shirts "Toro y torera" (bull and bullfighter girl) 100 % cotton, for adults, available in several sizes, with funny patterns around the bulls world. Perfect souvenir of your visit to Madrid. Unisex T-shirts, 100% cotton, adult, available in various sizes and funny motifs. 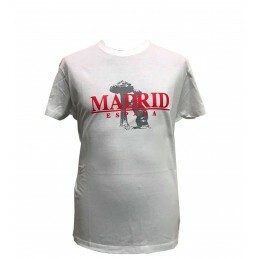 It is a perfect souvenir of your visit to Madrid. "Toro y torero" (bull and bullfighter having a beer) model. Made in Spain. 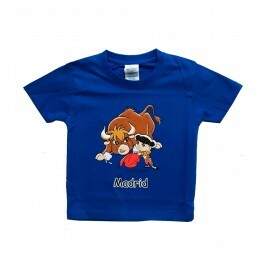 Child unisex T-Shirt, 100% cotton "Toro y torero" (bull and bullfighter). Bright colors and fun designs for the little ones from the house. Sizes from 1 to 14 years old. Made in Spain. 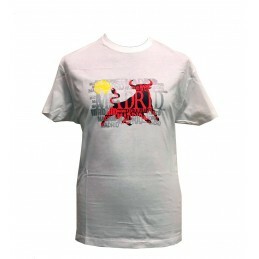 Adult unisex shirts, 100 % cotton, available in various sizes and fun motifs around the world of bullfighting. Typical souvenir as a memento of Spain. Unisex t-shirts, 100% cotton, available in adult sizes with several funny motives: bear and madroño, as perfect souvenir from your visit to Madrid. 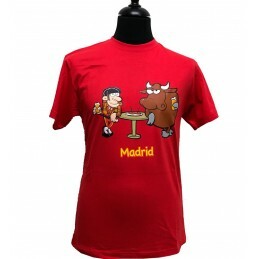 Unisex T-shirts "Madrid Toro" (Madrid bull), for adults, 100 % cotton. Available in different sizes and with funny drawings. 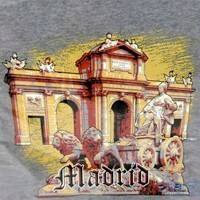 Perfect souvenir of your visit to Madrid. Funny shirt for children with the slogan "Alguien que me quiere mucho me ha traído esta camiseta de Madrid..:" (One who loves me gave me this shirt from Madrid). Infant unisex T-shirts, 100 % cotton. Bright colors and fun designs for the little ones of the house. Unisex T-shirts, 100 % cotton, adult. Madrid Original with Bear and Madroño. Unisex, available in several sizes, navy blue. It is made of 100% cotton and it is recommended not to iron on the drawing.It is a perfect souvenir of your visit to Spain. Made in Spain.